**Contest Closed** Winner is #129 Mari~ Congratulations!! 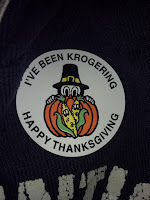 I have been a loyal Kroger shopper for at least 10 years. I think I go in there at least 3-4 times a week! Kroger offers really great prices and help you stretch your family budget. I buy almost all of my groceries, cleaning and household items from Kroger. I love that I can double my coupons up to 50 cents as well as the coupons that sometimes print at the end of my transaction. Right now Kroger has their buy 10 participating items and get $5 off. This helped me to get a jump on buying my holiday staples. My son loves getting his Kroger sticker at the check-out line! From November 13th through November 26th, with the purchase of any four participating General Mills products, you will either receive free milk (up to $3; limit of 2) or to receive $3 off your shopping order** Look for some of your favorite participating General Mills products like Cheerios, Pillsbury Ready to Bake Cookies, Nature Valley Bars and Fiber One Bars. To Enter: *Mandatory- Let us know what items you plan to purchase with the gift card if you win. Giveaway is open to US Residents only and will end at 9:00 pm EST on November 24, 2011. One winner will be chosen at random and contacted via email. Be sure to leave your email address if you do not have a Blogger profile. Momfiles is not responsible for any lost or stolen prizes. I plan to get Yoplait Yogurt. I like you both on FB with my username Mary Happymommy. I will stock up on Progresso and Betty Crocker. Thanks! I shop at Kroger all the time too! I love their stores in Sterling Heights MI especially the produce. If I won, I'd buy veggies and fixings for the two vegetable casseroles I am bringing to my parents house for Thanksgiving. I'd stock up on cereals, including Cheerios if I won the gift card. I plan on stocking up on Cheerios and yoplait yogurt! I'll buy Cheerios and fresh fruit! I'll buy baking supplies for the holidays! I like you both on Facebook "crave to save"
I let you know on FB (Carolsue anderson) that I entered your contest! I plan to purchase meat, produce, milk, and pasta with the gift card. I follow you and Kroger on Facebook under the username likwan. I wrote on your Facebook wall and let you know I entered at http://www.facebook.com/momfiles/posts/10150567544333452. I follow you and Kroger on Twitter under the username likwan. I tweeted about this giveaway on Twitter at https://twitter.com/#!/likwan/status/139834222503399424.